ne Sunday I looked up and saw our church guitarist playing an instrument I didn’t remember seeing before . . . and I would’ve remembered this one. The body had long ago been painted black, but that didn’t hide the dents, scratches, and other signs of wear. I immediately assumed this must be Alan’s first electric guitar—the one he had learned to play on long ago. When I suggested this possibility, he quickly set me straight. What I learned about this instrument both surprised and inspired me. Alan had purchased the guitar from someone who had it custom-made. And the source material for the body of this guitar was an old church pew. Think about that: taking something from the church where you hear the Word preached, Sunday after Sunday, and carrying it with you. Put this in a spiritual context: How can you and I take God’s Word with us when we leave the church building? How can we make it a part of the soundtrack of our life? I believe the Bible itself assists us in this endeavor by communicating God’s story in creative and descriptive ways. Using literary devices such as proverb, metaphor, and simile, the Biblical writers painted word pictures that clarify as they compare. When we look to the Psalms, we find this example in 119:105: “Your word is a lamp to my feet and a light to my path” (NKJV). While the Bible is not a literal lamp, this powerful image assists us in understanding the message and ministry of God‘s Word. As it relates to our Christian walk, the Bible operates as a “lamp” that illuminates. This brings to mind a story that a minister once told me. When he was growing up in the 1940s and 50s, his father was a bi-vocational pastor who focused primarily on planting churches in rural areas. One night following a church service, my pastor friend was riding home with his mom and dad. Suddenly, his father realized he had left his Bible on the pulpit. No big deal, right? Well, apparently it was a big deal. In order to retrieve his preaching Bible, this pastor would have to go back the way he came. And you’re probably familiar with stories in Scripture where God told people not to go back the way they came (1 Kings 13:1-10; Matthew 2:12). I’m not sure how these descriptions of how God dealt with certain individuals became a prescription for all people, in all places, at all times. My guess is that someone studied the text, without considering the context, and came up with a pretext. Perhaps this pastor from yesteryear was being superstitious, or maybe he was just being “cautious” (as Barney Fife would say). Regardless of his motivation, he dealt with this dilemma by instructing his son to walk back to the church and get the Bible. As my friend shared this story with me, I could see that he vividly remembered running down that dirt road—a road surrounded by swampland and where a street light might be mistaken for a UFO. And once he secured his father’s Bible, it did not literally become a lamp to his feet and a light to his path. That Bible did not brighten that dark country road. The Word of God does, however, shine like a lamp on our spiritual pathway, reminding us: “Trust in the Lord with all your heart, and do not rely on your own understanding; in all your ways acknowledge him, and he will make your paths straight” (Proverbs 3:5-6 NKJV). The light of Scripture helps us to clearly see that “God has not given us a spirit of fear, but one of power, love, and sound judgment” (2 Timothy 1:7 CSB). And Paul shined God‘s light on superstition when he instructed Timothy to “have nothing to do with pointless and silly myths. Rather, train yourself in godliness” (I Timothy 4:7 CSB). This psalm was written at a time when there were no streetlights to dispel the darkness. Each person carried a lamp to illuminate the way as he walked along. Besides this, a light was usually left burning in the window, so one could know the direction for getting back home. The lamp that was carried gave a step-by-step guidance, and the light in the window gave general guidance to a destination. “The word of God is living and effective and sharper than any two-edged sword, penetrating as far as to divide soul, spirit, joints, and marrow; it is a judge of the ideas and thoughts of the heart” (Hebrews 4:12 CSB). In the New Testament, the writer of Hebrews portrays the Word of God as “sharper than any double-edged sword” (4:12 CSB). This analogy always reminds me of my Grandpa Lanier. He planted and pastored churches in some rough areas and difficult situations. He once received a death threat from a farmer who didn’t like the fact that his wife was now saved and filled with the Holy Spirit. Another man challenged Grandpa’s spirituality by bringing a sack of snakes to church. That didn’t work out well for the visitor or the vipers. And I was recently reminded about the time my grandfather placed his Bible and pistol on the pulpit, then announced it was “Pastoral Vote Sunday.” Amazingly, he got the vote . . . and no recount was requested. I like to think Grandpa was ahead of his time by pioneering an “illustrated sermon” that day. Regardless, the Bible is presented in Hebrews 4:12 as a different kind of weapon. 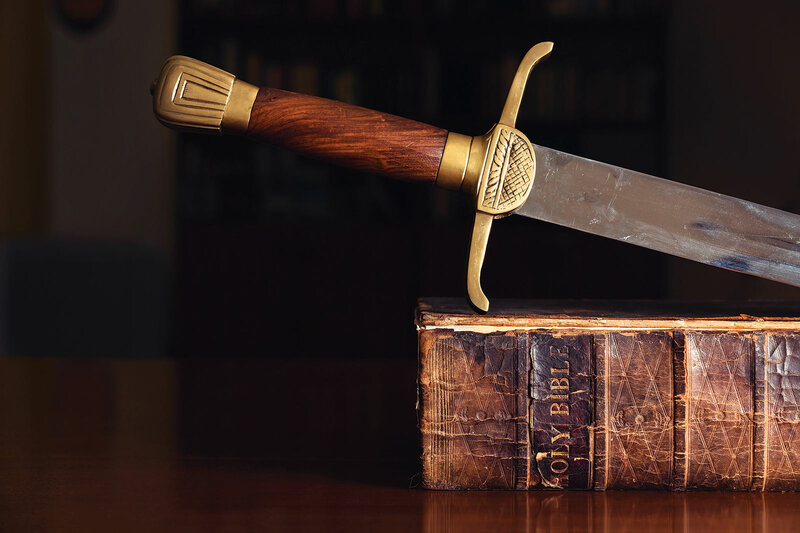 It is a sword that penetrates, “as far as the separation of soul and spirit, joints and marrow.” It is also a scalpel that operates: “able to judge the thoughts and intentions of the heart” (CSB). The Book of James is referred to by many scholars as the Proverbs of the New Testament. Its proverbial wisdom is on full display in chapter 1, where the half-brother of Jesus gives us a great “word for the Word.” He imagines Scripture as a mirror that reflects. And he warns those who are only “hearers” of the Word, and not “doers” (v. 22). They simply glance and go their way, not taking take time to reflect on their reflection (vv. 23-24). I’m so glad the story doesn’t end there. The writer goes on to describe the “doer”—one who takes an absorbing look into God’s Word and finds a mirror that corrects. In verse 25, a word picture becomes a word of promise: “The one who looks intently into the perfect law of freedom and perseveres in it, and is not a forgetful hearer but a doer who works—this person will be blessed in what he does” (CSB). Tim Lanier is pastor of College Park Church of God in Huntsville, Alabama.